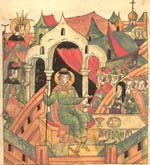 The following is the story of Aleksandr Nevskii, war hero and statesman of medieval Novgorod, as recorded in a 16th century manuscript. 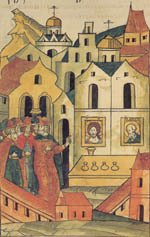 The manuscript is currently housed at the Saltykov-Schedrin Public Library in Saint Petersburg, Russia. In all, some 83 illuminations are reproduced on these pages (with both thumbnail and enlarged views for each) and accompanied by an English translation of the original narrative. To preserve space, the original calligraphy and writing have been eliminated.